Are you free in Oxford tonight, in the Isle of Wight on Friday, in Essex on Saturday or near Harrow on Sunday? You should get yourself to Andrew Peterson‘s concert with Eric Peters. They are both American singer songwriters who tell the gospel story powerfully in song. You might remember Andrew Peterson from this blog before – he’s the author of the much loved Matthew’s Begats. He and his friend Eric sing of God’s grace and goodness in creation, in tough times, in the Lord Jesus. We heard them in Birmingham last night and enjoyed it very much and came home laden with new music to listen to. That the mess is there. Just the song for me! So, my recommendation is that if you’re available, you should go. Really. Details of the concerts can be found on Andrew’s website – scroll to the bottom of the page to find the links. We’ve had some builders doing some work on the Vicarage this week. 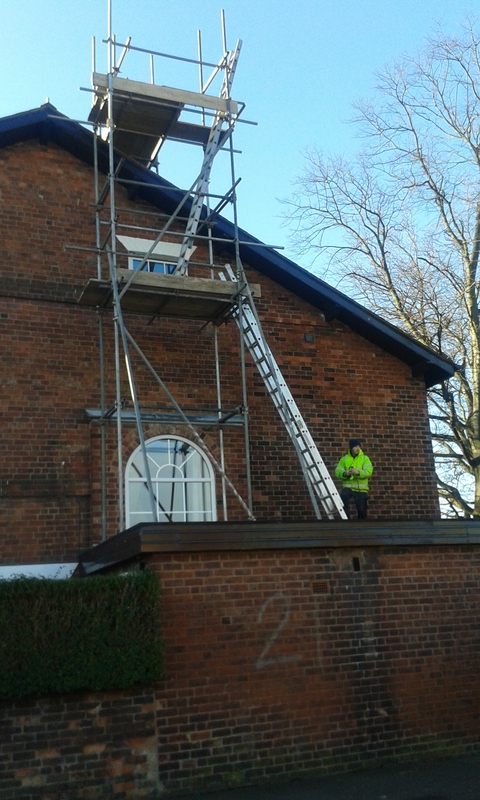 Because they couldn’t actually fly, they had scaffolding put up the side of the house so they could access our roof. There’s been a damp wall in the attic since we moved in six years ago and they’ve at last got round to having a look from the outside. They found the problem – missing flashing and some poor tiling work. So they’ve been up and sealed it all up. We’re pleased it’s been sorted. And I’m even more pleased that I didn’t have to go up there myself – three storeys of Victorian ceilings make for a bit of a skycraper. Especially not in the bitter cold and sleet that came a little later on. On my way over to the church hall to prepare for the consumption of soup and flapjack at Lunch Club Lite today, I took a couple of pics in the churchyard. One of the church looking fantastic in the chilly morning sun. The other, alas, of a random bit of flytipping. Or perhaps there’s someone who likes to sit and then practice some balancing tricks between the East end of the church and the Vicarage garden. Thankfully, Ministry Trainee King spent the morning clearing the grounds, so the chair is no longer cluttering the churchyard. Glad that he’s in charge over there – it’s enough for me to be decluttering the Vicarage (four items gone today, mostly kids’ things that are too small). Bleugh. I’ve had a slow start to the year. But a friend has challenged me (and some others) to do some decluttering in this dullest of months. So a group of us are chucking stuff out. One thing on 1st February, two things today, three things tomorrow, four things the day after… all the way up to 28 items on the last day of the month. Those of you with maths heads will have quickly worked out that this will lead to me having a grand total of 406 fewer bits of toot in the Vicarage. It sounds like a lot. Well, it did to me. But then I started looking round the house with different eyes. I surveyed the contents of the bathroom cabinet (saving it for a couple of weeks’ time) and had a brief peek in the Queen’s craft cupboards. I’m already starting to think I’ll need to do the same thing all over again in March.